A quick look at this playroom I just worked on for a client who needed a little feminine feel infused into the design. We went with a softer color scheme and a beautiful "frosted petal" paint color for the walls. I love that this will be a play space without a television. The Carolina grow-with-you activity table was our starting point. It comes in three colors and starts low to the ground but you can switch out the legs to raise the table to a height that works with children's chairs. You can't beat the style and price of the Devon indigo blue chairs. A hand-bent birch frame with a whitewashed finished gives the piece a coastal yet traditional feel. The high back is perfect for snuggles and stories. 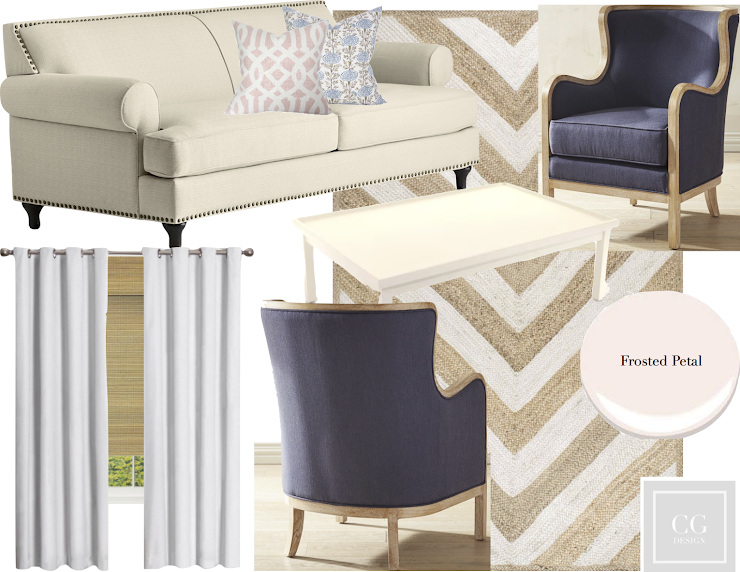 We added a little texture and patten with the jute chevron rug. It grounds the space and the light colors allow the piece to have impact without dominating the room. The colors are mimicked on the walls in the roman shade and drapes. Not to give it all away, but the couch is on clearance! RA x CP Collection Launch!